You've come a long way - Don't blow it now! "Over 100,000 people helped since 2005"
Homepage » Poker Tips » How to Win a Poker Tournament » Dominating the Late Stage of a Poker Tournament » You’ve come a long way – Don’t blow it now! You’ve come a long way – Don’t blow it now! You’ve been playing for three hours and well over half of the field is history and you have an average sized stack. It’s folded all the way around to your small blind and you raise it up four times the big blind with 9-9. The big blind calls and you are both to a flop of 3-5-A. Without much thought, you move all in. Wait … Don’t Blow it Now! In my early days of tournament play I did this a couple of times because it’s so easy to do. It’s very easy to get mouse click happy and make a silly play to lose all your chips. 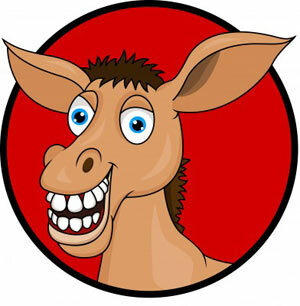 In the poker world you would be referred to as a “donkey” and the nickname for doing this would be to “donk off your chips”. Poker is a psychological game. It messes with your mind which is another reason that it is so addictive! In the example above it is easy to believe that you are way ahead going into the flop. You believe that the big blind is only calling you with rags because THEY believe you are trying to steal their blind. You thought, “if I just make a strong bet here, then I can take this pot down and move onto the next hand, he has nothing anyhow, he was in the big blind” and before you have thought it through you have clicked all in. You are under the over riding impression that if you check the flop all is lost if they bet. You also know that if you make a standard continuation bet and get called again then it’s going to be difficult to continue in the hand, so rather than face the fact that you may have been out flopped you raise it all in. And image how surprised you are when the big blind shows A-J and busts you out of the tournament. Once you’ve busted out of a tournament like this it can hurt for a long time afterwards. Busting out of tournaments when you’ve spent hours playing and are in a reasonably comfortable position is a painful mind experience. Firstly, the raise with the 9-9 in that situation was the correct play but once the flop comes with the Ace as an overcard to your pocket pair you have to start to consider that you are beat. Ask yourself if you have enough chips to make a continuation bet and are prepared to fold to resistance. If you do then go for it. If you were short stacked you would have raise it all in before the flop anyhow. If you had just made a simple continuation bet after the flop, then the big blind would of either called or raised you, giving you that extra information that he had a hand and would of allowed you to give further consideration as to whether he had the Ace or another hand that beat you. This probably would of led to you folding the hand having paid just a small price for the information you need rather than all of your chips and the end of your tournament. Resisting the urge to click the “all in” button is something that you can only learn to do through experience. It’s so easy to move all in with this situation and it’s so often the end of the tournament for those that do. There are lot’s of different ways to play this situation and it all depends on the type of player that you are. What you have to consider is what you have to gain by entering into a blind on blind battle with a medium pair. Another important factor in this hand is that the big blind has position on you throughout the hand so it makes it even more difficult. Trying to constantly steal from the small blind is a beginners error and will frequently bust you out. Much of tournament poker is about what you believe. In the above situation you have to think that with just the one overcard to your nines you are still in front, but the likelihood of you being called with an Ace is much higher than being called with a smaller pair. Overcoming donk plays is one of the hardest skills in tournament poker to learn. It’s so easy to push all in and hope for a fold and it’s mind numbing when you get shown a much better hand by the big blind. With experience, you will learn to think fully about every decision and that one of the most important skills as a tournament player is to limit you chances for bad decisions. Situations like this are just presenting opportunity for a bad decision and you would be much better off resisting the urge to move all in and risk your tournament life. Another example, you can be cruising along quite happily when you look down at K-Q hearts suited. You are first to act, but you haven’t played a hand for several orbits as it’s been rags, rags, rags. You raise it up four times the blind and watch it fold all the way around to the big blind who moves all in. Without thinking it through and in frustration at being card dead, you call and he shows A-K. Yuck! And that’s essentially the problem with being good at tournament play. In the blink of an eye you can lose several hours work by being too quick on the mouse trigger! Texas Holdem Omaha Omaha Hi Lo 7 Card Stud 7 Card Stud Hi Lo Razz 5 Card Draw 2-7 Triple Draw Badugi HORSE Choose your GameSelect the game you play the most from the drop down list. Cash Games Tournaments Sit & Go Tournaments Choose your FormatSelect the format you prefer to play from the drop down list so I can tailor my recommendation. Europe USA Rest of World Select your LocationSelect where you are based from the drop down list so that I can make sure I only recommend sites that are available to you. I'll find you the best value Promotions, Bonus & Freebies! I'm soooo bored - please let me help you! What format do you play? What Stakes will you be playing?